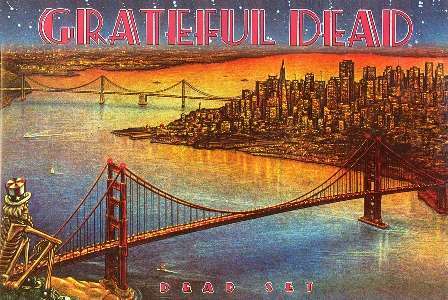 Vintage style Grateful Dead poster. This one resembles the 1981 live album cover of Dead Set. The Dancing Skeleton overlooking the San Francisco Bay. It measures approximately 36" x 24" and would look great on your wall or dorm room. Officially licensed Grateful Dead merchandise.